Hallertau Blanc hop pellets. Alpha Acid 9% - 11%. A daughter of Cascade, Hallertau Blanc was bred specifically to answer the needs of American craft beer styles. It has a moderate to strong flavor and aroma, featuring notes of pineapple, gooseberry, white grape, fresh lemongrass stalk, and passionfruit. It's reminiscent of many recent Southern Hemisphere varieties, but with a cleaner, less ‘dank’ profile. 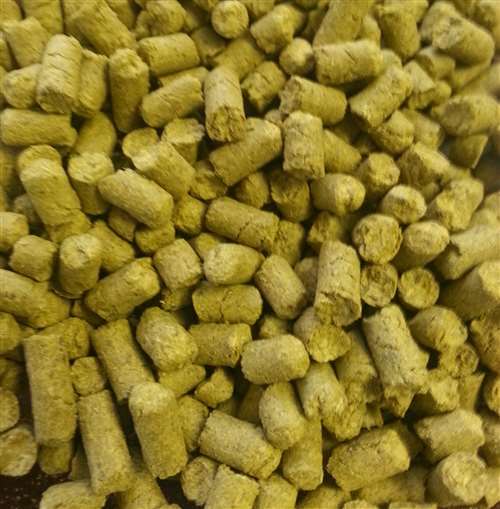 Hallertau Blanc is used as an aroma variety, particularly in whirlpool and dry hopping to take full advantage of the very high myrcene fraction. Aroma: Notes of pineapple, gooseberry, white grape, fresh lemongrass stalk, and passionfruit. Additional Information: It's reminiscent of many recent Southern Hemisphere varieties, but with a cleaner, less ‘dank’ profile.